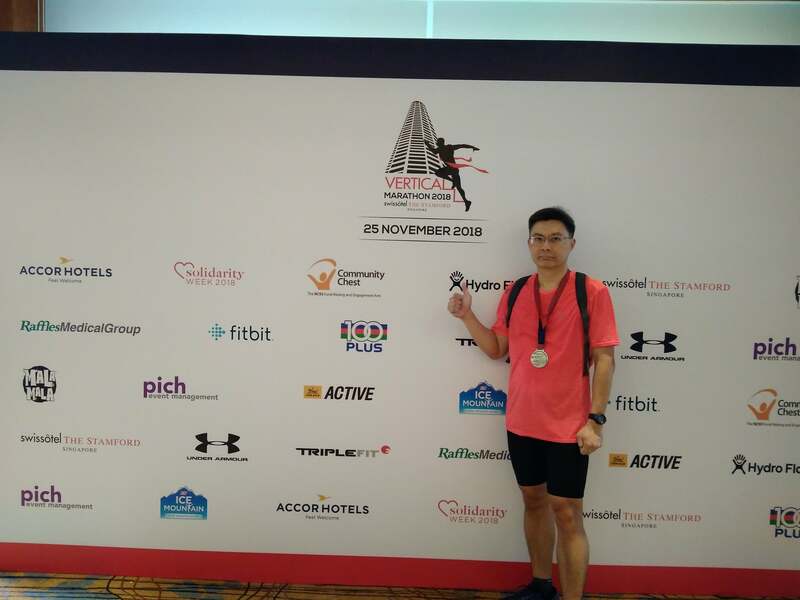 Review: Swissotel Vertical Marathon 2018 (by stargazer) | JustRunLah! 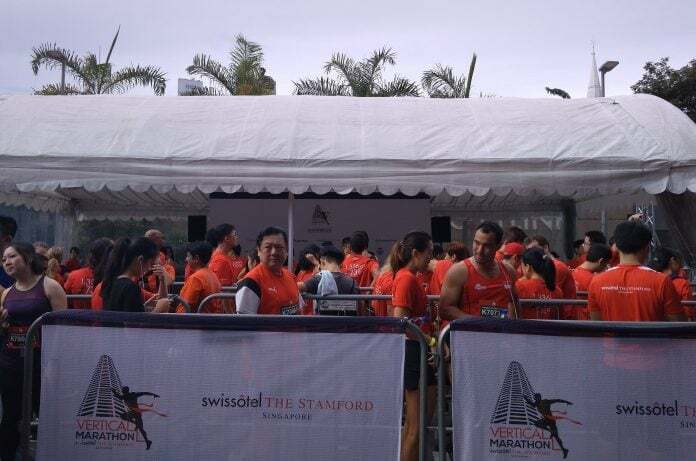 I’ve always wanted to participate in the Swissotel Vertical Marathon. 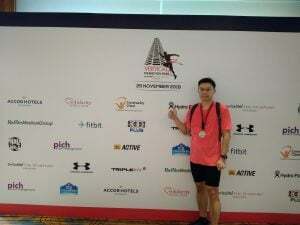 I consider it as the marquee event amonsgst the local vertical races as it has been held in Singapore for more than 10 years and offers the highest building available for the public to challenge themselves. Also, there are not many vertical races locally (only 4 such races this year). Hence, I decided I got to try it at least once for the experience and memory. I am also using this race as a motivation to kick start my ‘staircase climbing’ regime, in preparation for next year’s mountains hikings. Training is simply climbing stairs – 2 steps at a time. I did not plan to run up as I believe my heart will not be able to take the stress. I wouldn’t want to risk a cardiac arrest. 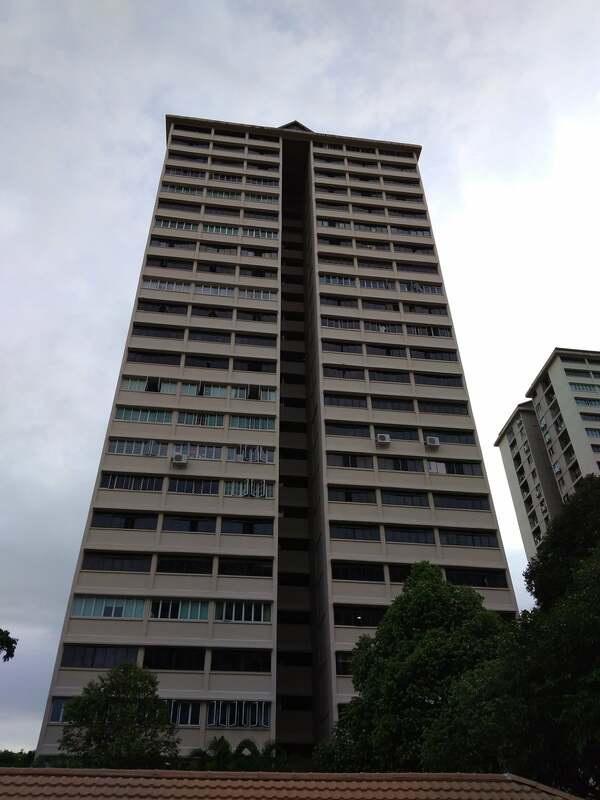 Hence I took it easy – walk up stairs whenever possible and choosing my residential HDB block and a nearby point-block for the purpose of training. 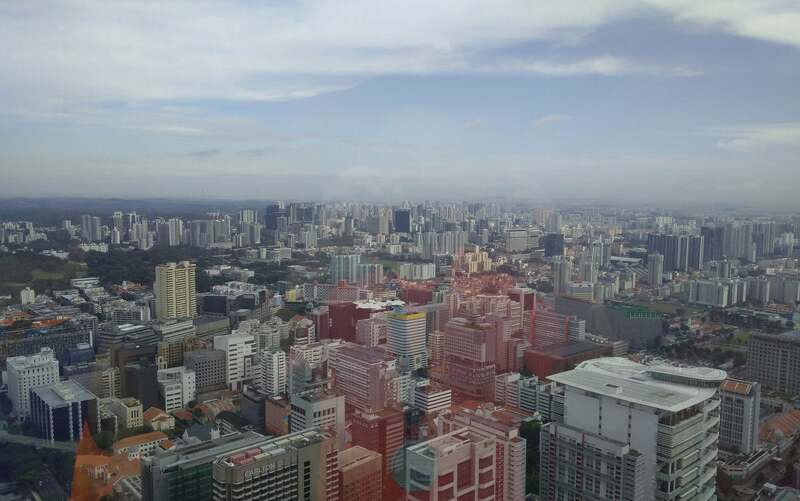 Well, you can have a nice view at 25th storey too, depending on where your location is! REPC was at TripleFit, Millenia Walk. TripleFit is the official fitness partner and thus not surprisingly, there are vouchers which relate to the purchase of merchandise items at the outlet. There are also F&B vouchers for dinning at SKAI and Stamford Brasserie as well, but alas, they are not valid on the eve and on holidays, else I may consider using them for the coming festive season. 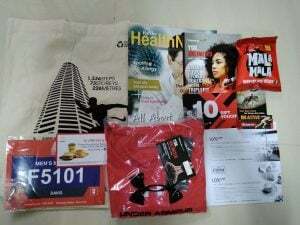 The event shirt from Under Armour appears too large, though I managed to exchange it with someone to a smaller size. But even after the exchange, I still find it quite ‘flappy’. In the end, I decided to wear my own shirt for the race. I had hoped it rains on Saturday so that the possibility of raining on race day Sunday is lesser. But it was not to be. It started to rain at 6 am in the morning and I received an sms message notifying that the flag off times have been delayed due to the wet weather and lightning risk. Logging to the event facebook, there were a torrent of queries from runners seeking clarifications, such as the revised flag off times. But the organizer was not able to advise. I took some more sleep, assuming the race will indeed be delayed. I woke up again just before 7 am and found that the race had commenced and that the flag off times were per normal! I hurriedly took my usual race day breakfast and took the train to City Hall. I reached at 8.20 am. By now, the rain had stopped. 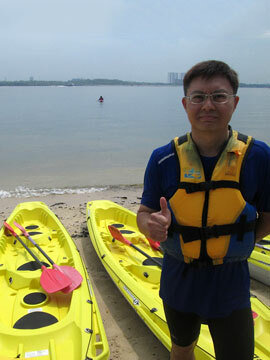 I was taking part in the Mens’ Masters category, which was scheduled to flag off at 8.25 am. I did some warm-up exercises and thereafter joined the runners queuing in the start pen. Before long, I was flagged off with 5 other runners. I slowly jogged to the start of the staircase and commenced my climb 2 steps at a time. It was really an enclosed space, so I didn’t expect to find any window to view nice scenery to describe here. It was a rather monotonous climb. However, I did not feel stuffy, though I had read some previous participants commenting on this. Perhaps the organizer had installed portable blowers to increase air circulation? There were volunteers stationed at every 4 or 5 levels, encouraging the runners to keep going. Soon enough I reached Level 69, where I was directed to the Finishing Point at the Skysuites. I was given my finisher medal and ice mountain bottled water for hydration. I took some rest and pictures of the external scenery. It was nice, but I know it can’t be compared to what I will see at Level 73, Helipad. I had target to complete the race within 20 mins and I managed to do so in 14 mins 33 sec (provisional result). 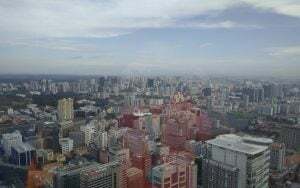 However, I didn’t feel really happy as I had wanted to finish at the ‘top of Singapore’, not in an air conditioned room. After some time, I took the lift down to Level 4, and then to the race site at ground floor. I took a can of chilled 100 plus for further hydration. The next prize ceremony was scheduled at 1120 am, but I didn’t plan to stay. 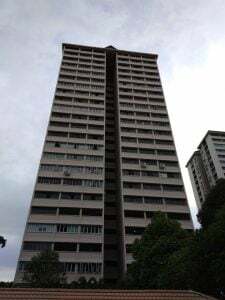 As I was about to leave, I heard the organizer announced the upcoming runners will be able to complete their race at the top floor. Well, lucky fellas! 1) The race fees are not cheap. But runners are willing to pay primarily for the ‘finish at the top’. So frankly, I am very disappointed not able to do so, even though the rain had stopped and there wasn’t any lightning. 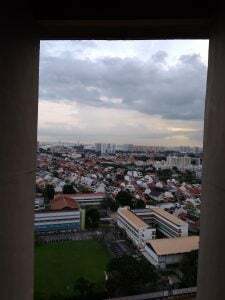 If we are limited to just 5 mins at the top for photo takings, I believe we should be able to take care of ourselves and stay accident-free within this 5 mins? I trust the runners in my category or before me would agree with me. 2) I think if the organizer announces there will be a delay to flag off times, they should stick to the announcement and let the runners know the revised flag off times. Runners will not mind a 30 mins delay in order to facilitate a safer race and a better finish. 3) Apart from the ice mountain and 100 plus drinks, there is nothing else for energy replenishment. Even though it is just a short vertical race and not the usual road races, I guess some fruits or even biscuits would be welcoming. 4) I wonder why participants have to pay for bag deposits? 5) I feel the booths for Hydro Flask and Raffles Medical were located too far from the lift point at Level 4. Most of us will turn right from the lift to proceed to take the escalator down. Therefore, I am afraid not many would have noticed these 2 booths on the far left. I may have completed the race, officially. But somehow I feel the race is still ‘uncompleted’. It is akin to the feeling of climbing kinabalu without reaching the top. In conclusion, if you ask me whether I will repeat this race next year or in the near future, after thinking through today’s events, my answer is – probably not. Click here for more post from stargazer. Well done, didn’t know you were there too ! Disappointed wasn’t allowed to go helipad as the rain already stopped. Did you manage to finish at the top this year? I was in the earlier batches so only at 69th too. Maybe I’ll blog too. Was in two minds but will reference to yours for the readers so that they get a better whole pic. Me from another angle perhaps. Will see how the next couple of days. FYI, they have published the official photos in their fb.